I have been a real slacker in the creative, online community. Just a quick one this morning that I'd like to share, kind of easing myself back in. but hopefully you don't have my brown thumb!!! 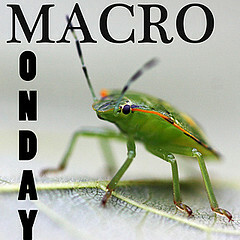 Join in with the other Macro Mondayers at Lisa Chaos. .... Happy Spring!!! Lovely color - happy spring and happy macro Monday! I love the colour of that lily! WOW!